If you love an outdoor adventure in stunning scenery this is your tour! 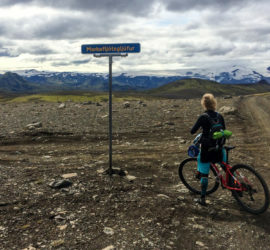 You get to experience astonishing landscape that keeps changing before your eyes as you bike further: vast meadows overlooked by snow-capped volcanos, waterfalls and endless lava fields. 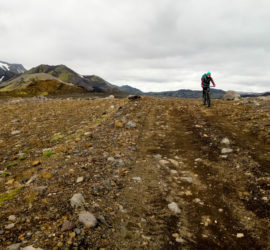 Accommodation in a mountain huts, a local mountain bike guide that bikes with the group all the time and a driver will follow in a 4WD vehicle that carries the entire luggage. Early departure from Reykjavik and about 3 hours drive to the mountains. The ride of the day starts on one of the most remote mountain road of the highlands. Our first night is spent in a charming hut owned by the farmers of the area. 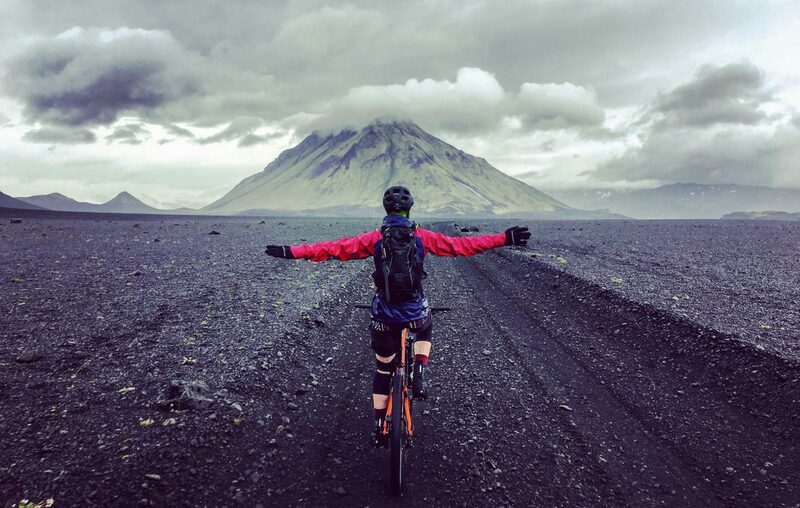 The ride of the day starts from our hut at the foot of Hekla, Iceland’s most active volcano. 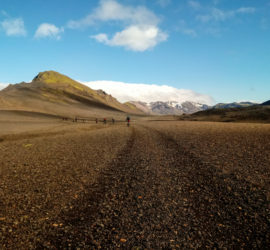 It stretches through black desert sands before entering the amazing Dómadalur region with smooth grass-covered mountains on one side and endless lava fields on the other. Our second night is in a hut placed in the heart of the highland. The stunning area of Landmannalaugar, famous for its palette of pastel colored mountains. 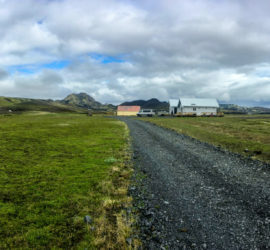 And the home of the most epic landscape in Iceland. The word “undulant” is probably the best one to explain what characterize the rides here. We will have multiple 100 – 300m climbs and some shorts hike-a-bike sections during the day, always followed by a rewarding descents. In addition we will end the day by a soak in a warm natural pool. We start our day by a very steep climb up a double track called “Pokahryggur”. A name given by the local farmers that used to put a sand filled bags under the tires of their jeeps to manage to ride up the road. But the climb is rewarded by a great descent on a remoted mountain road through a landscape of impressive hot natural springs. We will drop down in between valleys and crossing few cold rivers before joining our comfortable mountain hut. The last stay starts off on a great highland road that follows the river Eystri-Rangá all the way down to the coast. 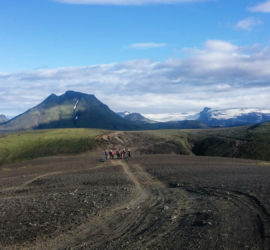 The view is magnificent with Hekla volcano overlooking us on our right and Tindfjallajökull glacier on our left. Drive back to Reykjavik with arrival in the afternoon. Note that we can tailor made it as a private tour for all the range of riding levels. Group size: From 4 - 9 participants. Biking distance: ~25 - 30 kilometers pr. day. 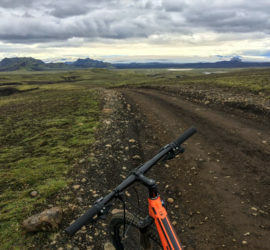 Bike and equipment: The perfect bike for this trip is a five or six-inch all-mountain hardtail mountain bike with disk brakes. If you bring your own bike, it must be in excellent working order. Lodging and food: Accommodations are in remote and authentic lodges located in special remote locations. Rooms at the lodges vary from smaller six-person rooms to rooms that will accommodate the whole group (and sometimes others). The food is hearty and typical of the area. Bike Company supervises the preparation of all meals. However, group member participation is required. Please let us know in advance if you have any dietary considerations. 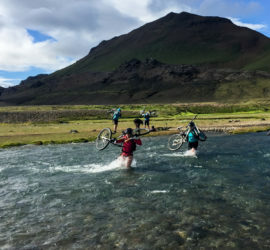 Technical level: The Biking Adventure in the Highland is rated as moderated to challenging for good mountain bikers used to physically demanding routes with basic off-road riding skills. Fitness level: The adventure level is high on this trip. 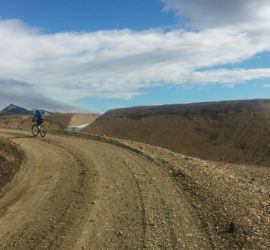 There are a few long hike-a-bike sections and riders can expect 5+ hours in the saddle daily. As you know, the fitter you are the more fun you'll have. Questons? Feel free to send us an email at info@bikecompany.is if you have any questions.